Releasing the Magic! : THINK TEAM: THE STORY OF THE GEESE! 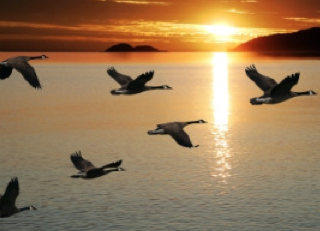 I have been thinking about the fragmented educational landscape and the important of teamwork and I love this story..."This Autumn, when you see the geese heading south for the winter, flying in a "V" formation, you might consider what science has discovered as to why they fly that way." "As each bird flaps its wings, it creates an uplift for the bird immediately following. By flying in a "V" formation, the whole flock adds at least 71 percent greater flying range than if each bird flew on its own. We encourage and support when we honk from behind? If we have the sense of a goose, we will stand by each other like that." Great story, great message...and whatever you do remember that we are better if we think team!